Happy Friday everyone! I'm taking off for a good friend's wedding in Chicago this weekend, but I wanted to play a little catch up on some outfit posts. I've found that this past year I've really focused on expanding my cardigan collection. As much as I like sweaters, cardigans are perfect for me since I feel like I'm constantly temperature regulating between warm buses, chilly outdoor weather, and warm or cold office temperatures. A cardigan gives me the flexibility of buttoning all the way up if I'm cold, opening up if I'm slightly warm, or easily slipping off the outer layer when I'm warm (and easily slipping it on when I get a sudden chill). I've been slowly whittling down my collection of non-cardi sweaters because I find them less versatile. What I've found as I've grown my cardigan collection. 1) I really like cardigans from Anthropologie for very whimsical and different looks. 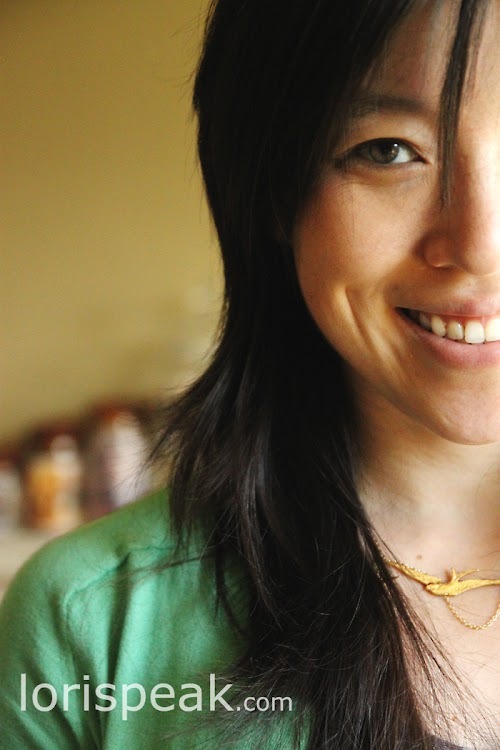 2) I love J.Crew and Lands End Canvas cardigans for basic good quality cardigans in wonderful colors. I seem to be collecting cardis in a multitude of colors. 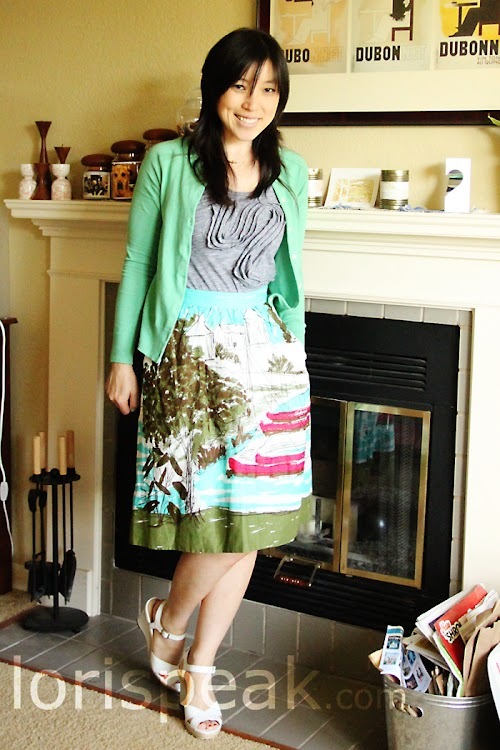 When we moved into Spring and Summer, I really wanted a lighter green cardigan. So I tried out the Lands End Canvas Heritage Cardigan. I found the cotton wonderfully soft and the fit is wonderful. It is a semi-fine knit that seems like it will hold up well. It's slim through the body and arms keeping me from looking like a bag. I got this cardigan in an XXS but I got other cardigans in XS to try out sizing. I found that both sizes had a great slim fit, but the XXS pulls a bit more at the buttons when I button-up. So I'd think I'd be more likely size up to an XS in their cardigans (For reference, I typically take XS in J.Crew cardigans too). Cardigans are perfection, I truly believe it! You look beautiful, I adore that green on you! Great outfits! You look very pretty. I usually shy away pairing green with red because some how it give that christmas feeling. You prove me wrong. The combo of the greed and red are so perfect and so you! Love it! Very nice photos and outfits Lori. The last combo really catches my eye, great job! 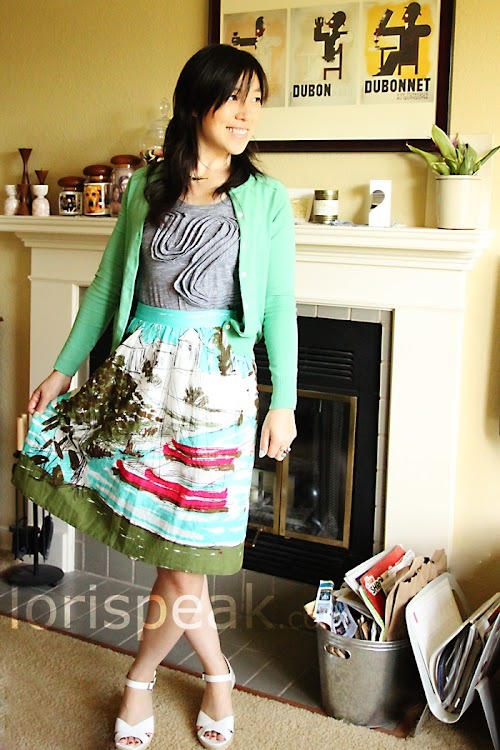 That green is gorgeous- I love it with the colours of the seabound skirt. Your loose side-braid is adorable! I've been on the hunt for a navy blue cardigan or a light pink one and the ones from Land Ends Canvas seems to fit the bill! Thanks for your review. And I love the versatility and utility of the everyday cardigan. Everyone of my outfits has to have a cardi to pull it together. I have also expanded my cardigan collection like crazy this year. Just call me the Crazy Cardigan Lady! 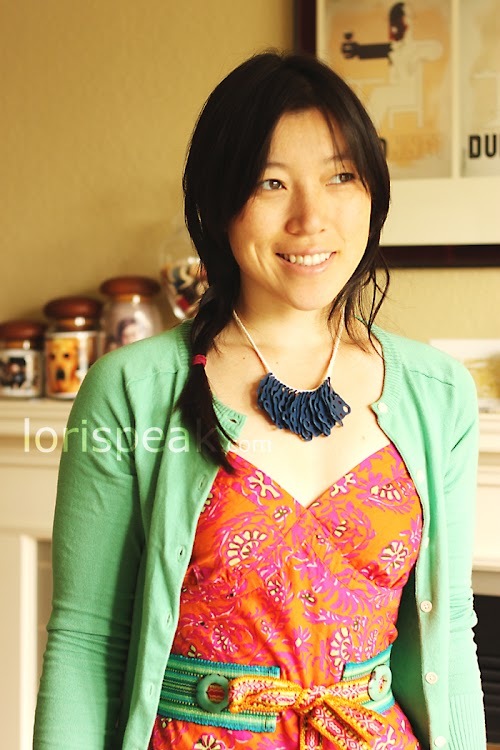 Hi Lori, OMG I just got almost exact same mint cardi from Target clearance and didn't know what to do with it. You rock! I now have much better idea of this new color I got! Your outfit looks so refreshing!